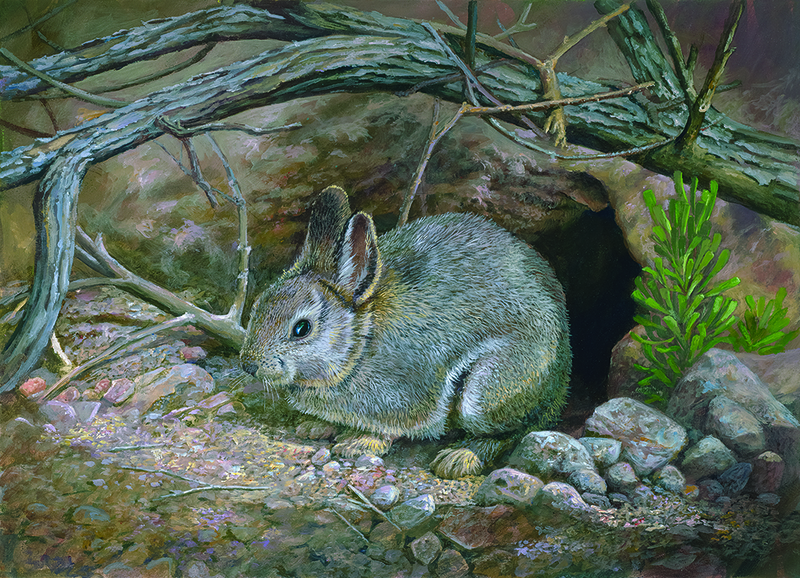 The 2018 winning artwork of Pygmy Rabbit by Kip Richmond of North Carolina is featured on the label of Duck Pond Cellars’ Conservation Cuvee Lot 6. SALEM, Ore – Enjoy fish and wildlife art, wine and music at the Oregon Department of Fish and Wildlife Art Show and Duck Pond Cellars’ Conservation Cuvee Lot 6 wine release party. This free, family-friendly event is Saturday, Nov. 3 from 1 p.m. – 4 p.m. at Duck Pond Cellars, 23145 Hwy 99W, Dundee. Artwork submitted by artists competing for ODFW’s 2019 Habitat Conservation, Upland Game Bird, and Waterfowl Stamp contests will be displayed. ODFW will announce the winning entry from each contest which is then used to produce collector stamps and other promotional items with proceeds benefitting Oregon’s fish and wildlife. Visitors can vote on their favorite artwork for the People’s Choice Award, enjoy live music by Bri Cauz, and sample complimentary tastings of Conservation Cuvee. Duck Pond Cellars’ winemaker, Trevor Chlanda will release Conservation Cuvee Lot 6 labeled with the 2018 contest’s winning artwork of Pygmy Rabbit by Kip Richmond of North Carolina. Please dress warmly as the event will be held in the winery’s production cellar. This stamp and art prints feature fish, wildlife, plants and invertebrates identified in the Oregon Conservation Strategy as species of greatest conservation need such as the Kit Fox, Western Painted Turtle, Chinook Salmon and many others. Revenue helps restore habitats essential to declining or at-risk species native to Oregon. Purchase a Habitat Conservation Stamp or art print. This year, artists were asked to feature Lesser Scaup, Red-breasted Merganser, American Green-winged Teal, or Greater White-fronted Goose in their natural habitat. Sales of this stamp fund waterfowl management projects such as population surveys, banding, and wetland management and enhancement. For example, wetland rejuvenation and enhancement projects at Klamath and Fern Ridge Wildlife Areas got underway this year. These projects were funded in part by sales of the Waterfowl Stamp. Purchase a Waterfowl Stamp. Artists were asked this year to showcase Ruffed Grouse in its natural habitat. The sale of upland game bird stamps funds game bird research, surveys, habitat improvement and conservation projects. Stamp sales are also used to purchase birds for 11 youth upland hunts around the state, to promote game bird hunting opportunities, and to support the Upland Cooperative Access Program in the Columbia Basin. Purchase an Upland Game Bird stamp. Conservation Cuvee Lot 6 is the sixth in a series of Duck Pond Cellars’ specialty wines that benefit Oregon’s wildlife. The winery crafts a limited edition wine and donates $5 for each bottle sold to ODFW’s Conservation Program. To date, Duck Pond has donated $42,385 which is used to benefit species of greatest conservation need in Oregon. Check Duck Pond Cellars’ website for more information on their conservation efforts. “Conservation Cuvee Lot 6 Pinot noir has rich fruit tones of black raspberry and dark cherries with subtle framing of new French oak. It’s best to enjoy this wine over the next two to three years,” Chlanda said. This special Pinot noir, made with fruit from Duck Pond’s Coles Valley Vineyard in the Umpqua Valley, can be purchased at Duck Pond Cellars or through the winery’s website.